It's a full five tiers of savory goodness. Now this is a cheesy wedding idea we can get behind! 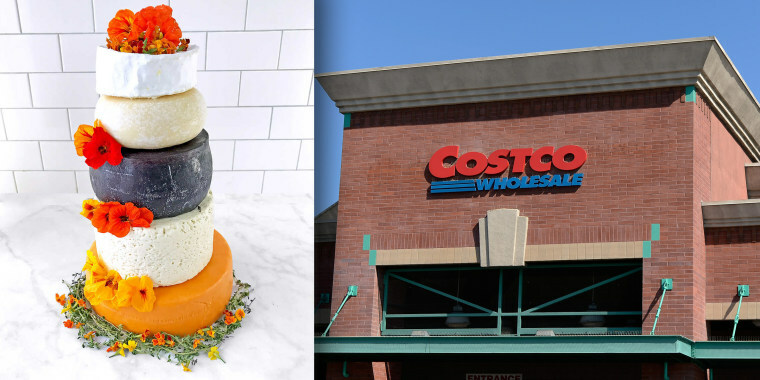 Costco is selling an artisan wedding cake made entirely of gourmet cheese. For $439, this five-tier 24-pound “cake” from Sid Wainer & Son can serve 105 to 150 guests at your wedding, and it includes Red Leicester, Danish Blue, Murcia al Vino, Tuscan Sheep’s Cheese and Brillat Savarin Triple Cream Brie, according to the description. The best part is it only takes two to three days to get to you after you order it. Considering most traditional wedding cakes need to be ordered months in advance, that’s a quick turnaround. Needless to say, the unusual wedding cake is getting lots of buzz on social media. Many cheese fans are excited about the possibility of serving this to their future wedding guests. One user commented that if she doesn't have the savory centerpiece at her wedding, she's not having a wedding at all. Costco is selling a 5-tier wedding cake made of cheese and well..... I hope everyone likes cheese and is in for a big surprise at the wedding. The idea of alternative wedding cakes is nothing new. Some brides and grooms have been breaking from tradition and going with out-of-the-box cake ideas including pizza, doughnuts and pies. The cheese "cake" (not to be confused with cheesecake, of course) could be the next big wedding tren — and we’re all for that!